This year’s Super Bowl saw the premier of another Samsung ad that many are calling a direct attack against Apple and the iPhone. While I can appreciate some of the thinking behind this campaign, there are some things that bug me about the messaging. To start with, I thought I would first break down some of the primary and secondary messages this ad is trying to send. Our device is great, and it is available now. Waiting in line for a device is a bad thing. Our device represents something counter to the mainstream. Those that wait in lines are not free-thinkers. While this style of messaging is used often to convey the “our thing is different” message, this particular ad bothered me on a couple of different fronts. Our device isn’t worth waiting in a line for. People are required to line up for Apple devices. Apple is more than happy to let users pre-order their new products online and enjoy them from the comfort of their own home. iPhones represent a majority of the market. Android, the platform Samsung is promoting, is actually the dominant player in the mobile market. Apple is big and they have a lot of fans, but they don’t represent a majority. Those that wait in line dislike the fact that they are there. Huge lines and rowdy crowds congregate out of excitement to get a new product in their hand, they are there out of enthusiasm, not necessity. 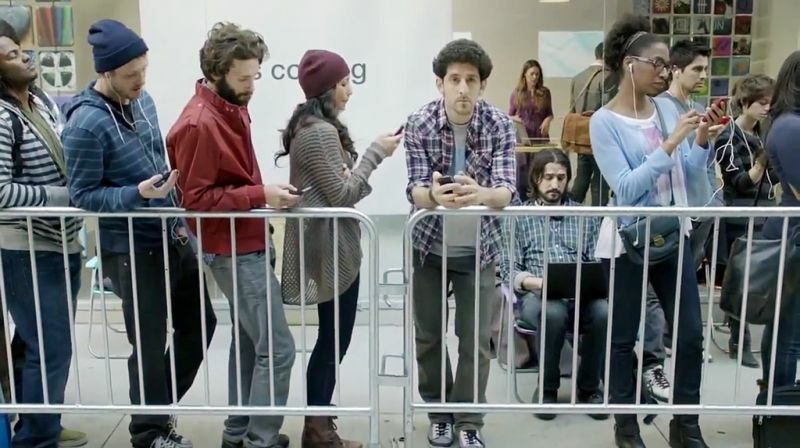 To try and frame this commercial in a different way, imagine a line of people waiting to go to a concert. This is a band that everybody in line enjoys, they paid money for their tickets, and they are excited to see the show. Somebody walks by with a boombox playing the music from a different band. Somebody from the line inquires about what band the passerby is listening to. The passerby tells them the band and mentions that they are playing across the street, and that there is no line to get in. Are we to believe that everybody in line will now ditch the concert they are in line for to go and find this new band? Really, what has changed about the fact that these people are lined up? The existence of another band that is also good doesn’t change the reality that they are already there to see a band, and this band is worth lining up for. I admit that I may be biased in this analysis, but the takeaway here is that messages in media are never truly singular, and it is important to be aware of everything that we say, intentional or not.